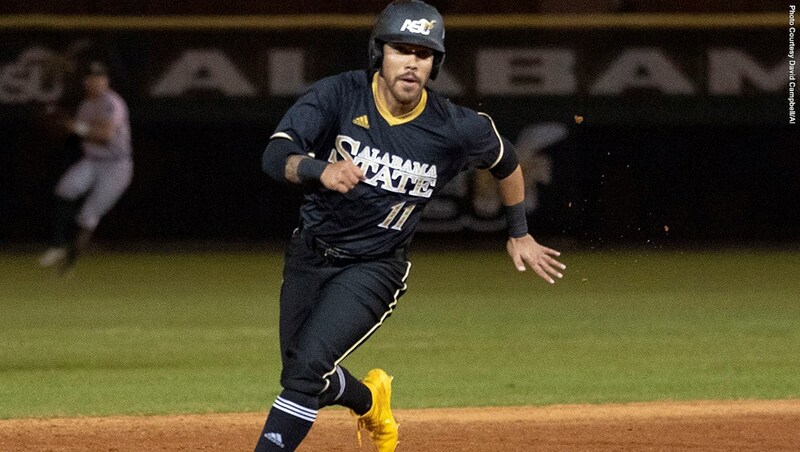 MONTGOMERY, Ala. | Alabama State exploded for 34 runs in a doubleheader sweep of Alcorn State in Southwestern Athletic Conference (SWAC) play Saturday, winning the first game 21-2 and winning the nightcap 13-1 at the Wheeler-Watkins Baseball Complex. Alabama State (19-15, 13-3 SWAC) used a pair of big innings, in which they combined for 22 runs in the two games, and five more home runs on the weekend to ease past Alcorn State. The Hornets combined for 33 hits in the two games, including 18 in the opener, and got quality starts from the pitchers on the day. Darren Kelly (5-0) went 5.0 innings and allowed just two runs (both earned) on four hits with four strikeouts in the opener. Gage Dollar and Manny Bezares each worked an inning in scoreless relief for the Hornets, as Alabama State jumped on top early of Alcorn State 2-0 after the first inning. They added another run in the third to extend the lead to 3-0, before erupting for 12 in the third. Yamil Pagan finished 3-for-4 with four runs batted in, including his 10th home run of the season; while Eriq White finished 3-for-5 (including his third home run of the season) with three runs scored and three RBI. Noel Cheneau finished game one 3-for-5 with four runs scored in the opener, and connected on his fifth home run. Santiago Garcia finished 3-for-4 with three runs scored and a pair of RBI, while Hunter May collected a pair of hits (including a home run) and five runs batted in. Angel Jimenez with a pair of hits and RBI in the opener. In the nightcap, Alabama State and Alcorn State were deadlocked at 1-all through four innings, before the Hornets erupted for 10 in the fifth to take an 11-1. They added two more in the sixth for the final margin, as Ricardo Rivera (4-2) went the distance and allowed just one run on five hits – with four strikeouts. Jimenez led Alabama State with three hits in the nightcap and an RBI, while Pagan finished 2-for-4 with a pair of runs scored and an RBI. Cheneau collected a pair of hits – including his sixth home run – and two RBI; while May hit his fifth home run in the season in the win. The two teams will meet in the series finale Sunday afternoon at the Wheeler-Watkins Baseball Complex with first pitch scheduled for 1 pm. The game will be carried by the Hornet Sports Network.